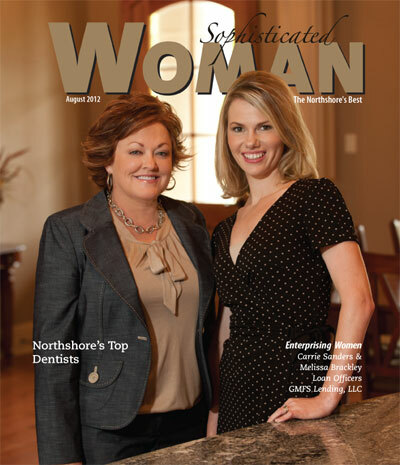 GMFS Mortgage Covington Loan Officers, Melissa Brackley and Carrie Sanders were interviewed for The Northshore’s Best Sophisticated Woman August 2012 publication. At different phases of their lives, Carrie a happily married mother and grandmother, and Melissa a happily married mother of two young children — both women and work toward the same professional purpose. Educating their clients and walking them through the multi-step process in obtaining a home loan is their ultimate goal. “Our job is to navigate the process for people looking for a new mortgage product, or seeking to refinance their current mortgage,” says Melissa. “We pride ourselves on taking an in-depth look at every client’s profile to determine what product is right for them, and what needs to be done to obtain that product. We realize that not every person who walks through our doors fits the same mold.